A recent breakthrough in the development of an artificial synapse suggests that assistive devices and other prostheses won't be limited to just missing joints and failing organs. Researchers in Japan have shown that it's possible to mimic synaptic function with nanotechnology, a breakthrough that could result in not just artificial neural networks, but fixes for the human brain as well. Synapses are essential to brain function. It's what allows a neuron to pass an electric or chemical signal to another cell. Its structure is incredibly complex, with hundreds of proteins and other chemicals interacting in a complicated way. It's because of this that cognitive scientists and artificial intelligence researchers have had great difficulty trying to simulate this exact function. 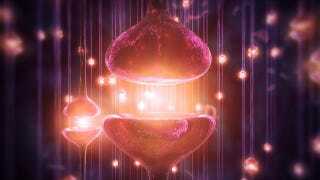 But a new study published in Advanced Functional Materials has shown that it may be possible to reproduce synaptic function by using a single nanoscale electrochemical atomic switch. Japanese researchers developed a tiny device that has a gap bridged by a copper filament under a voltage pulse stimulation. This results in a change in conductance which is time-dependant — a change in strength that's nearly identical to the one found in biological synaptic systems. The inorganic synapses could thus be controlled by changes in interval, amplitude, and width of an input voltage pulse stimulation. Why this is exciting is that the device is essentially mimicking the major features of human cognition, what the researchers refer to as the "emulation of synaptic plasticity", including what goes on in short-term and long-term memory. Not only that, it responds to the presence of air and temperature changes, which indicates that it has the potential to perceive the environment much like the human brain. The researchers are hoping that their newfound insight could help in the development of artificial neural networks, but it's clear that their system, which operates at a microscopic level, could also be used to treat the human brain. The day may be coming when failing synaptic systems could be patched with a device similar to this one, in which biological function is offloaded to a synthetic one. Via Machines Like Us. Image via Shutterstock/Michelangelus. Inset image via Materials Views.